Teddy Roosevelt: not just hunter, but also gatherer. Young Theodore took inspiration from the yarns of a “novelist and adventurer” named Capt. Thomas Mayne Reid, who blended hunting, natural history, and exploration into stories guaranteed to captivate a frail and bookish lad. It was under Reid’s spell, writes Smithsonian Institution mammalogist and curator Lunde, that Teddy began his own natural history collection, starting off with a much-prized seal skull (the rest of the body, we learn, was too decayed to keep) and building from there. At about the same time, he was privy to planning sessions held in his family home for what would become the American Museum of Natural History. Lunde writes that the well-connected young man could easily have become a staff curator, but, inspired by his reading and research and his father’s exhortations, he headed for the wild. In this pursuit, he mirrored many other naturalists who went into the field with notebook in one hand and rifle in the other. 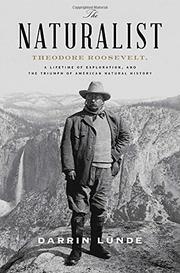 If much of Lunde’s account is a straightforward biography of Roosevelt in scientific mode, a distinct subtext is a kind of nostalgia for the natural history of old and for the “intrepid museum naturalist” whose era “may very well be coming to an end.” The author turns up some interesting tidbits on the future president’s expeditions, including a lion-hunting trip to Africa helped along by guides in ways that recent critics of a certain Minnesota dentist may recognize; it is useful to learn from Lunde that Roosevelt also had plenty of critics in his own time who decried his apparent bloodlust. More useful still is Lunde’s portrait of Roosevelt as a kind of working amateur scientist in communication with professionals and other amateurs to build scientific institutions and, indeed, field science itself.